Australian responsible investments quadrupled to $622 billion since 2014. Although responsible investing was perceived as a fringe activity in past decades, it has now firmly entered the mainstream. According to 2017 consumer research by the Responsible Investment Association of Australasia, 92 per of Australians expect their super or other investments to be invested responsibly and ethically. The Global Sustainable Investment Alliance says that in 2016 there was more than $22 trillion of assets being professionally managed under responsible investment strategies, an increase of 25 per cent since 2014. In Australia, the growth has been even more significant, more than quadrupling between 2014 and 2017, to $622 billion, or 44 per cent of all investments having some form of responsible investment strategy, according to the Responsible Investment Association. We believe the rise of responsible investing is being driven by the conviction that the world’s greatest challenges – climate change, conservation and human rights – require more than just a “business as usual” approach. There is a growing realisation by investors that their money, especially super and investments, can be used as a force for good to solve these larger ethical problems. At Australian Ethical we have an in-house ethics research team whose job is to ensure every investment we make aligns with the 23 principles of our Ethical Charter. It was developed by our founders in 1986 and is still guiding decisions today. The application of the charter means we invest in future-building sectors such as renewable energy, biotech, healthcare and technologies that increase efficiency. We avoid investments in fossil fuel companies, non-renewable energy, mining, logging of natural forests, companies involved in the manufacture of tobacco, weapons, gambling and those who mistreat their workers or cause unnecessary cruelty to animals. This scrutiny applies to both onshore and offshore investments. Our International Shares Fund provides investors with an ethically screened slice of the MSCI (ex-Australia) Index. The outcome is a diverse range of future-building stocks that meet all the principles of the charter and includes global leaders in the new economy, such as Tesla and Vestas. At the time of writing there are around 1,600 stocks in the broad MSCI (ex-Australia) Index. Once we apply the positive and negative screens of the charter to create our unique investable universe, this number reduces dramatically to around 300 screened stocks. We then optimise this investable universe using a risk model that minimises the performance difference between the portfolio and our benchmark. This optimisation determines the final set of stocks included in the portfolio, which currently sits around 190. That means more than 1,000 of the stocks in the index fail our ethical or investment analysis on one or more parameter. Our approach is to track the benchmark index as closely as possible with the specific aim of achieving a return in line with our benchmark over a rolling three-year period. The International Shares Fund (wholesale) has delivered 12.2 per cent over one year and 12.2 per cent per annum after fees since inception in July 2015. The retail fund has been around since June 2007 but originally focused on international renewables stocks only. In 2017 it broadened its approach by adopting the current model based on the MSCI universe. 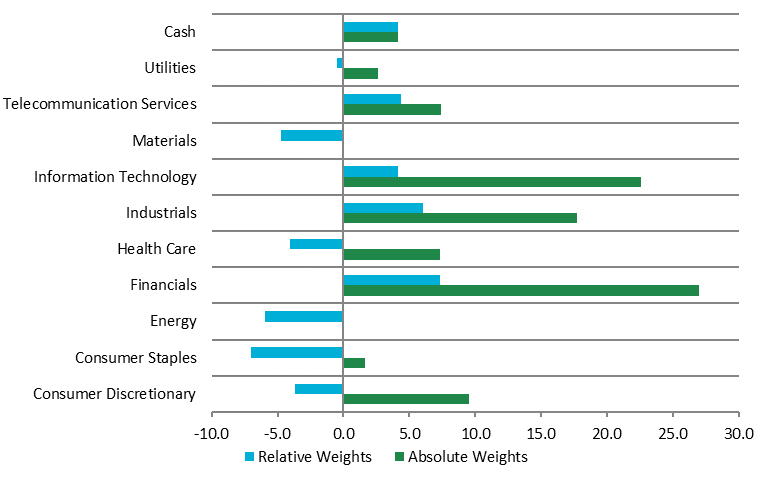 As illustrated by the chart below, the International Shares portfolio is weighted towards themes such as information technology, energy efficiency, waste management, recycling and telecommunications. We hold no stocks in the traditional energy sector or materials sectors that involve the mining and manufacture of products that are harmful to humans, animals and the environment. We also avoid investment in consumer products that promote non-essential consumption, such as fashion or fast-moving consumer goods. (Editor's note: Do not read the following ideas as stock recommendations. Do further research of your own or talk to a financial adviser before acting on themes in this article). Vestas Wind Systems is a Danish company that designs, manufactures, installs and services wind turbines across the globe. At 31 March 2018 it had a worldwide installed wind capacity of 92 gigawatts in 79 countries, including Australia. According to the company, the newest generation of Vestas turbines can, in three hours, produce enough electricity to supply the average household for an entire year. We like that the company is part of the solution for global issues such as climate change and energy security; and its focus is on controlling emissions and waste from its operations, with targets for further reduction. Australia Ethical has a significant holding in Legrand, a French industrial group that has performed strongly over recent times. Legrand offers a range of products and solutions that connect millions of buildings (commercial, residential and industrial) to energy, data and lighting. The product range includes interfaces, energy distribution, building systems, cable management, digital infrastructures, and uninterruptible power supply and installation components. We like the strong R&D on smart-building and energy-efficiency innovation; and the company’s leading market positions in France, Italy and the United States. Ray Gin is Portfolio Manager at Australian Ethical, a leading fund manager in ethical investing. Australian Ethical is an mFund member. ASX Investment videos feature some of the market's best commentators and are a great way to stay in touch with market trends. This article appeared in the July 2018 ASX Investor Update email newsletter. To subscribe to this newsletter please register with the MyASX section or visit the About MyASX page for past editions and more details. This article appeared in the July 2018 ASX Investor Update email newsletter. To subscribe to this newsletter please register with MyASX. This article appeared in the July 2018 ASX Investor Update email newsletter.